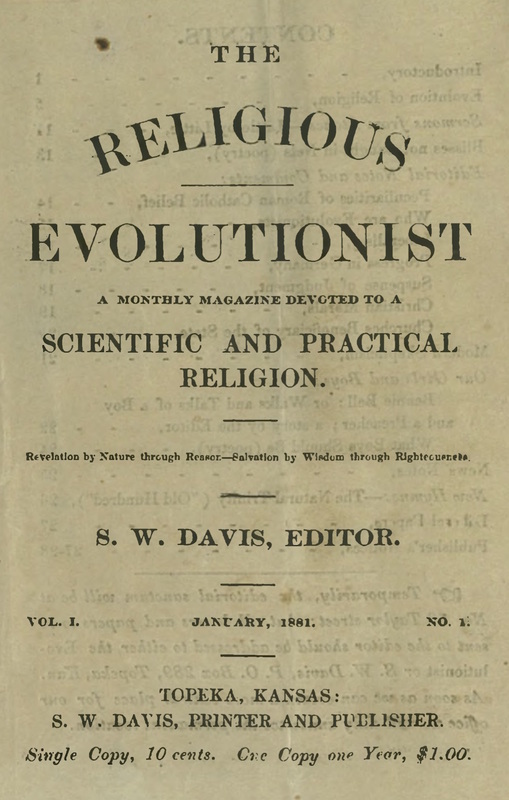 A Monthly Magazine Devoted to a Scientific and Practical Religion. Topeka, KS. Publisher: S.W. Davis, Printer and Publisher. Editor: S.W. Davis. 1/1, January 1881. 28 pp., $1.00. This was an exponent of the congeries of elements that made up "reform" during the period: anti-Catholicism, radical separation of church and state, liberalism, opposition to "alcoholic drinks, tobacco, quack medicines, obscene 'specialists,' and lotteries whether in saloons or church fairs"—all directed toward a new, more highly evolved and rational religion of the future. It sought to address "free thinkers and liberals who delight in taking broad, bold and unprejudiced views of religions subjects," one of which was spiritualism. The first issue promised a close examination of "facts that are, doubtless, worthy of places in gaining a knowledge of immortality and the spiritual world." The journal also featured the editor's novelette for children, "Bennie Bell: or, Walks and Talks of a Boy and a Preacher." Only one issue is known, the first, which was distributed without charge to attract subscribers and which was probably the only one published. Amherst College.